This level of need refers to what a person’s full potential is and the realization of that potential…the desire to accomplish everything that one can, to become the most that one can be. Individuals may perceive or focus on this need very specifically. For example, one individual may have the strong desire to become an ideal parent. In another, the desire may be expressed athletically. For others, it may be expressed in paintings, pictures, or inventions. 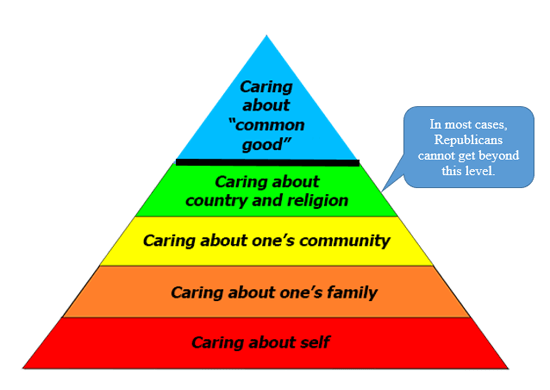 As you can see from the pyramid above, self-actualization comes after love/belonging and esteem. 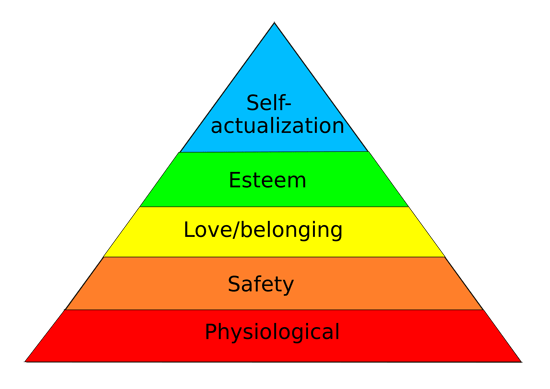 Maslow asserts that one cannot achieve self-actualization until he/she has secured the previous four needs. What does this have to do with politics? 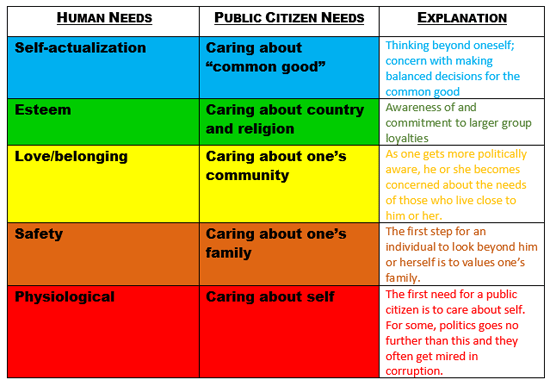 In order to address this question, I have created a comparable hierarchy of public citizen needs. The parallels between the two pyramids are as below. The explanations in the third column are important. The key component is that, for a public citizen to be fully actualized, he or she must have the ability to go beyond personal and group loyalties and to move to an awareness and concern for the common good. When progressives are not burdened with impulses to be snarky and nasty, they set the example for how to care about the general good. They want human and economic rights to be protected for all citizens, while working toward justice and fairness in the rules and laws that govern our society. They make every effort to not make decisions based on personal or parochial interests but rather on what proves the greatest good for the greatest number of people. 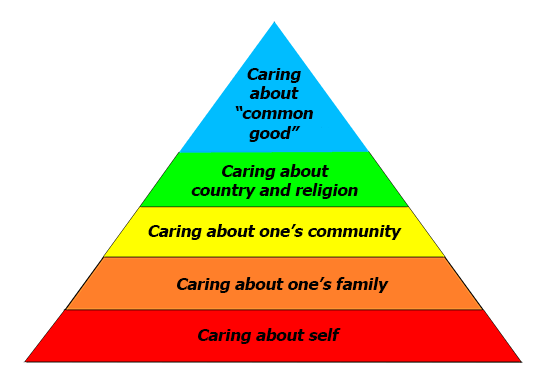 Reaching the highest level, “caring about common good,” generally requires an individuald to look both inside and around themselves. They must feel comfortable taking risks and sacrifice personal gains for the well-being of others. This is why we have members of the so-called “Freedom Caucus” advocating shut-downs of the federal government and Groundhog Day repetitions of trying to repeal the Affordable Care Act (without offering any alternative solutions). They simply do not care about the common good. Other Republicans may not resort to such extremes, but they repeatedly block attempts to weave a tight safety net for those among us who need help. More and more is being written about the Republican brain. There is general agreement that the cut-off for many Republicans is taking the final step to an awareness of what is the common good and how that must be a cornerstone of political decision-making. What is still baffling to this writer is why and how the mainstream press refuses to point out this dichotomy and operates with false equivalencies between progressive and conservative positions. Perhaps the movie “Truth” about Dan Rather and Mary Mapes of CBS News will present some insight on this issue.